I didn't know what to expect, but I didn't expect this. Both of my girls were close to Grannie. They often drew her pictures unprompted, spoke of her when we talked about the beach, and after they knew she was sick, asked about her repeatedly to see if she was getting better. The funeral was open casket, so Craig and I talked extensively with them about what they would see and what we believe happens when our life on earth comes to an end. As I said in a previous post, Abby touched Grannie as she lay in the casket, asked questions, and then seem to be content with Grannie being with Jesus. Hannah peered into the casket, but didn't want to get too close. On the surface, she seemed to be processing only little bits of everything that was happening and on a very concrete level (which is to be expected since she is only four). She was the comic relief of the funeral, asking in her loud Hannah voice if Grannie was going to be okay in that box as the pallbearers carried her out the the hearse. At the cemetery, she concerned herself with the pretty flowers left on tombstones and other family members, doling out hugs and a few quick smiles. That night, I heard her crying to Abby in bed about how she missed Grannie. It was a bit of relief to hear her cry because it signaled to me that she was understanding and recognizing the loss. I didn't realize it was merely the tip of the iceberg. Since we have been home, she has been much more emotional than normal. It's not that she has been sullen or sad, but rather desperate to have things done her way. She must be in control of every situation and when things do not go as planned, she becomes angry and inconsolable. Some of this is typical four year old behavior but it seemed to me that the increase in explosions could only correlate with Grannie's death. Her little heart can hold only so much sorrow, only so much confusion, only so much absorption of her family's grief. The overflow must escape somehow. Her age inhibits her ability to articulate freely about what truly troubles her, so instead, she wails about having to eat strawberries for breakfast. Yesterday, however, she found true release. It started with the Polly Pockets. We dressed them up, preparing them for the ball. They were ready. All that we needed now was the music. I happened to have my iPhone in the room and we chose a playlist. We danced and sang along to J.J. Heller's Your Hands. The next song came on -- Selah's You Raise Me Up, which also happened to be on Grannie's tribute DVD. I was about to turn it off, since we were supposed to be headed downstairs. At the sound of the first notes, Hannah's face lit up with recognition and then fell a few short seconds later as she realized what it was from. This is Grannie's song, she said. The dam broke. She wailed. Tears streamed down her face and all the feelings and questions that had been trapped in her heart spewed forth from her lips. I would tell her that Grannie was alive in Heaven. I don't want her to be in Heaven. I want her to be here with me. Oh, me, too, Hannah. I feel the same way. But in Heaven, she doesn't have to be sick anymore. She doesn't even have wrinkles. I liked her wrinkles, Mommy. Is she looking down on us right now? I hope so, baby. Mommy doesn't know a lot about Heaven, but I'm reading a book about it. Can I tell you about Heaven as I learn about it? Okay, Mommy. I miss her so much. I miss her, too. It's okay to cry as much as you need to, Hannah. Just like you cried at the funeral. Just like that -- anytime, anywhere. For over an hour, we had this conversation. I didn't have the heart to try to distract her, for fear that if I tried to plug up her heart, it would only lead to more destructive behaviors. So, I let her cry as we cleaned up her room, picked up Abby from school, as we ate snack. Later, she asked to hear the song again. I turned on my iPod and she sat on the counter, listening, silently crying until I took it back from her. I gave her a hug and she went off to play with her friend. She's still teetering on the edge, but through the song, she has a way to access those feelings, to cope with them, and bring them to light. As much as it took my breath away to hear her sob, as much as it broke my heart that my little girl has to understand death at such a young age, I feel blessed to walk through this with her, as imperfect and ill-equipped as I am to deal with it all. You raise me up...to more than I can be. There now exists a void in my life because Grannie is gone. It seems to be human nature to immediately try to fill the hole with whatever is closest, with whatever seems to bring at least some semblance of fullness, which for at least a time, satisfies. It has been interesting to step outside myself, to take time to pause and look at what I have been desperately trying to use to soothe my broken heart. Old habits that I was sure would come back have not, and one that I thought I was so over has reared its ugly head again. By now, I was for sure that I would be eating my way to China. In fact, before we left for the funeral, I found myself constantly hungry, nibbling here and there, convincing myself that yet another Cadbury Egg would not affect my weight that much. It was only about 9 years ago that I kicked the food addiction, although there have been periods of time that eating for comfort has entered my life again. Fortunately, I was able to stop it before it got out of hand. Coming back from the funeral, I was prepared to resist the desires, continually telling myself that eating would not bring Grannie back, would not make me feel better in the long run, would not ease my sadness. I've been home for five days and have not had to have the little pep talk with myself even once. In fact, for most meals, I have to convince myself that I really should eat, and that even if I don't want to, my children and husband do not look kindly on starvation. Onto the place where I know I am in the process of succumbing (my Bible study friends will be so disappointed!) -- my addiction to buying things. It's nothing outlandish. I deal mostly in petty stuff: a cute $5 shirt at Old Navy, a clearanced-out picture frame at Target, a draw organizer. No matter what the cost, no matter that I have the money to spend on it, I don't buy it because it is useful (although I can rationalize anything), I buy it because it brings me momentary joy. And, if it is an organizational tool, all the better, because I can prolong my joy with the process of organizing and beautifying! If I am busying doing this, I have successfully avoided dealing with the issue that is causing me the distress in the first place. Ta-da! Brilliant. But, do you know what I want to buy right now? Things of natural beauty. I want fresh flowers in every room in my house. I want new plants in my garden. I want an old-timey scrapbook (with coordinating papers and stickers of course) to put all the old pictures and momentos that I have from my grandmother. Okay, so the scrapbook is not a thing of natural beauty, but the art of creating it -- that uses natural talent, right? This is my rationalization in action here, folks. I think I am seeking things that represent new life or that chronicle and preserve the old so that it never dies completely. When I see beauty, I see my grandmother. New life pushes out the darkness and renews my sense of purpose. My frustration dies down and I can focus on giving my children what they need and not the by-products of my grief. I don't think Jesus would mind if I actually broke down and bought some flowers. But I think He just wants me to turn to Him first. I have to admit that spiritually, I'm just sitting here. I know He is there. I know that He is holding me up without me even having to ask. But I also know that I have not pursued Him much at all. I have not asked Him to help me shoulder the blackness that seems to cover my heart. I have hidden my face and I cannot even tell you why. For whatever reason, communicating with God on any real level seems hard, even though in my rational mind I know that the benefit of letting Him in far outweighs any difficulty in speaking to Him. Sometimes, it's just easier to buy flowers. 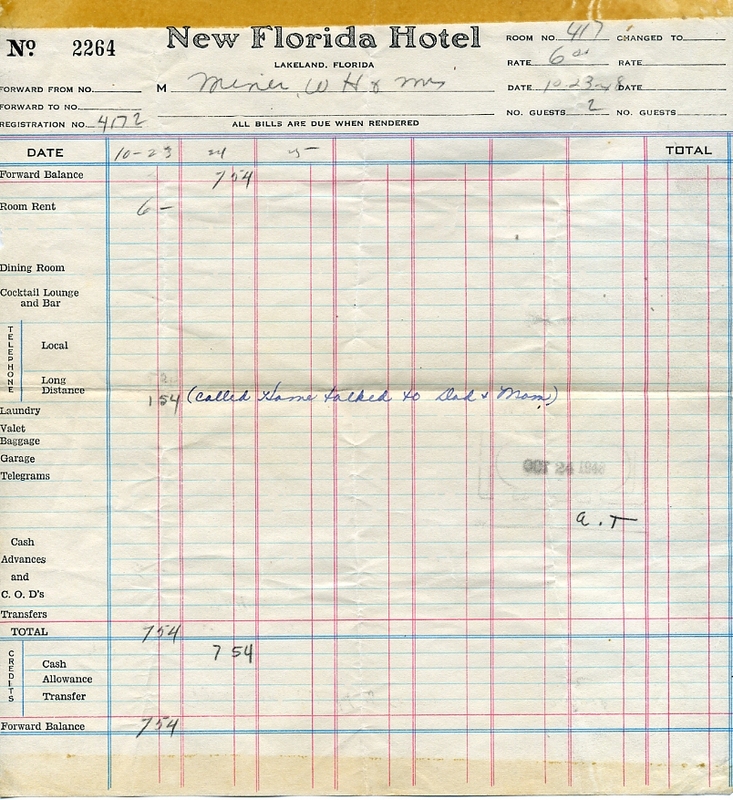 This is the receipt from the hotel Grannie and Howard stayed in on their honeymoon. What are the expectations for grief? I was angry at myself today for still feeling sad, melancholy, and, at times, just in a really foul mood. For some reason, I expected this huge relief of grief after the funeral. This is my first family member that has died to whom I was exceedingly close. I remember in high school, two of my friends died and I felt so much better after the memorial service. This time, though, I still find myself searching for answers, still getting caught in moments when I feel dumbfounded by such a profound sense of loss. It seems that others who have loved and lost can go back to their everyday lives, but here I sit still mourning. Then, it occurred to me: What if everyone doesn't just go on? What if they are just not so public about their grief? What if they rise to meet some arbitrary expectation that they should be able to move past the devastation and enter back into the normal routine of life? What if they still hurt, just like me? And even though all these things are so very true, it's not always the healing balm that soothes my aching soul. I think the healing balm may just be time and patience with myself. On another note, I have noticed a small, yet profound shift in my children the past couple of days. Yes, of course, there is still the bickering and occasional (or frequent, however one chooses to count) slap or hit. But now there is a depth that exists between them that I can't quite fully describe. It's a notion that they now know how to take care of each other, physically and emotionally. Death of a human being was something neither had experienced and they faced it together, head on, in a way that I think perhaps only children can. I remember Abby looking at Grannie in the casket and asking me if I was sure she wasn't just sleeping. No, honey. She's not sleeping, although it does look that way. She has died and we won't see her again here on earth. But she is alive in Heaven and we'll see her again when we get there. She then proceeded to test my words by touching Grannie's eyes. And her mouth. And the earrings. Not even I could bring myself to touch Grannie, for fear that the coldness of her body might be my last memory of her touch. And I was so proud of my daughter for showing even more braveness than her mother, for finding things out for herself and not just taking my word for it. Taking after my daughter, I have decided to go ahead and ask my hard questions about Heaven and how life works after the physical body finally gives out. I want to know if Grannie can still see me, if she can hear me, if I will ever feel her again. This is only for my own consolation during my stay here, for I am sure of her comfort and joy. My day did get better, by the way. I went running today for the first time in a week. My house is clean and I am putting things I brought from Grannie's house away. 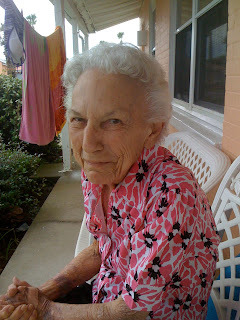 I am finding new things for which to be thankful and thinking of all the ways Grannie and I were alike and different. Just strolling down memory lane can bring me peace because it is there that I can find myself with her again. It's hard to know where to start this post. I don't think I have the energy to try to remember things sequentially. Funerals can be quite emotionally exhausting and because of this, it's hard to hold in the mind everything that I want to remember. The trip seems a bit disjointed, and as such, my blog entries might seem that way as well. Perhaps it's easiest to start with the present moment. 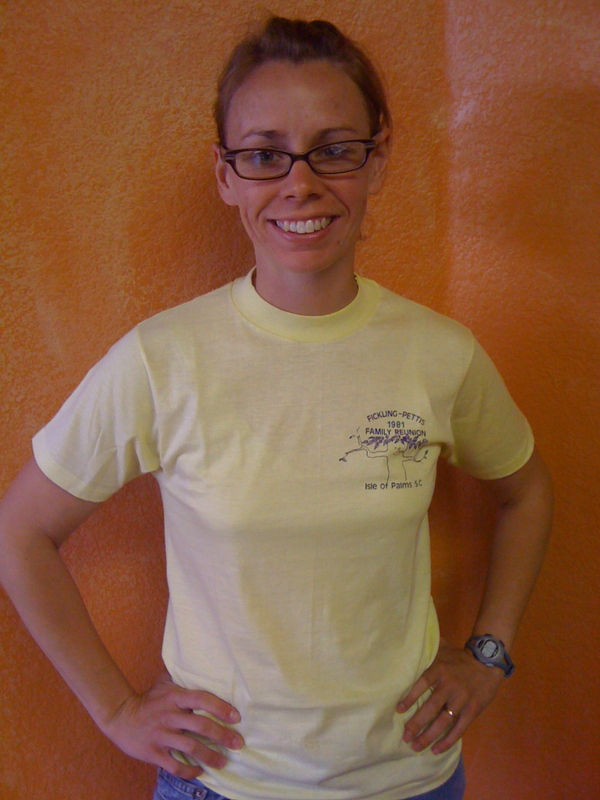 Currently, I am wearing a yellow shirt from 1981. It's from the Fickling-Pettis family reunion (I'd explain the names to you, but you probably don't care) and I found it in my grandmother's dresser drawer. The fabric is extremely thin, the collar a bit thick, and there are a few paint stains on it. But this morning, it smelled like my grandmother and that made it the only thing that I wanted to wear. Throughout the morning, I'd lift the shirt up to my nose and breathe in the scent. Then, about halfway through the day, I couldn't smell her anymore. Sadness! When I got home from the grocery store, I immediately put the other two t-shirts that I have from her in a ziplock bag and sealed it up to try to save her scent as much as possible. I'm not sure how long it will last, but at least it's there for awhile. Somehow, still being able to smell the scent of her house brings me comfort and, well, keeps her alive in a way. I find myself desperate to know that she can still hear me, that she can still talk to me, that somehow, I would still be able to feel her. I miss her so much it hurts. The night after the funeral, the kids were in bed, trying to go to sleep. Rather, perhaps I should say, we were trying to get them to sleep. My husband went to listen to their activity at the bedroom door. Hannah was crying (she's four). He was about to enter when he heard her say, I miss Grannie. Abby (5) said to her, It's okay. Grannie is in Heaven with Howard (her husband) and there are no tears in Heaven. My grown-up little girl, who had to say good-bye to someone she dearly loved, whose body lay in an open casket, who had to understand how a body still on earth can have a spirit in Heaven, was able to console her little sister. I find myself using these same words for consolation, too. I imagine her in Heaven, with no more tears, no more pain, no one to worry about. Only those who have gone before her to greet her at those pearly gates. Not that I am ready to leave earth, but I cannot wait to receive my hug from her when I get to Heaven. Oh, what a glorious day that shall be. During the funeral, during that oh-so-solemn moment when my dear cousins, the pallbearers, carried Grannie from the chapel to the hearse, Hannah belts out in her loud Hannah voice, Is Grannie going to be okay in that box? Sweet Hannah, Grannie will be more than okay, for she gets to meet her Savior. She will be filled with unspeakable joy, amazing refreshment, and unceasing beauty. Even though it may be hard to comprehend such exuberance since we are left to mourn, we can have faith that she will be fully entertained until we get up there to meet her again. My father actually gave the eulogy at my grandmother's funeral on Thursday, but I wrote it for him, allowing us both to say something about Grannie at the same time. I orginally wrote the story from his point of view, even though it was my story. For my blog, I've changed it back to my point of view instead of my dad's. By the way, he did a fabulous job. I'm not sure I could have said these things without completely dissolving. They say you shouldn’t judge a book by its cover, but I think you can get a pretty good picture of my grandmother just by looking inside her coffee table. Apparently anything of great importance gets stored there. One day, while searching for a lost address, I discovered these three contents (among many others, of course, but I’ll just hit the highlights). First, I found my dad’s Ph.D. dissertation. You probably won’t be surprised that the book was covered in a plastic bag, with the original letter that he wrote her neatly laid on top. My guess is that the book was not in there for casual perusal, as the topic was nuclear fusion. Rather it remained there for decades because she was proud of my dad. Grannie was proud of her entire family, physicist or not. No matter the skill mastered, the accolades received – large or small, no matter whatever stature in life, Grannie would always find something to praise, something to applaud, something that made your heart swell with pride and make you feel good about yourself. Even when I was in the depths of despair, she somehow managed to help me see the positives in any situation, to ease the heavy burden off my shoulders for a few minutes, and let me bask in the light of her praise and affirmation. I love the fact that my dad’s dissertation was hidden in a drawer, for it shows her unceasing humility. She was a woman with a true servant’s heart, who waved away thanks and praise because for her, all she was doing was giving out of her heart. I am sure that there were times when she didn’t want to do what she was doing, but one would never be able to tell. The fact that she never kept track of her immeasurable good works enabled her to continue giving freely. She never felt entitled, or the need to be repaid. She never sat back to get what she was “owed.” She gave until she could give no more. Eventually the wagon master (an affectionate term bestowed upon her by her sweet sisters whom she drove to all their appointments, shopping, etc.) had to hand over the reins. She always said that she wanted to go out before she had to become dependent on anyone else, but I think God gave purpose to her long bout with cancer. Because she could no longer be self-sufficient, she left this earth knowing how to receive, and how to let go. And essentially, she left giving all of us one last gift – the opportunity to serve and love her the way she first loved us. Moving on, the next thing I found was the Coral Sands Inn & Seaside Cottages folder. 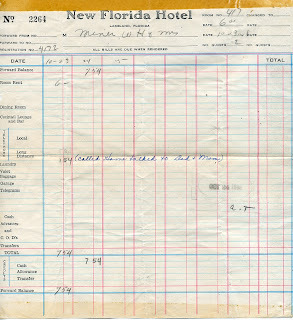 I didn’t spend too much time looking inside, but it is quite possible that there was a good 3 decades worth of receipts in there, as Grannie was not the type to throw away such “important papers.” Being the second youngest in her family of five siblings, she was one of the last to have grandchildren, so when the first one arrived, it was time for her to take her very own granddaughter, sit her down in the sand and commence building drizzle sandcastles. It was to be her shining moment of grandmotherhood. Unfortunately, hopes were dashed. Quickly. As soon as I was plopped in the sand, I screeched, “Yucky!” With that, I had to be whisked away to the pool where I could be happily sand-free. Fortunately for Grannie, I eventually got over her fear of sand and never disappointed my grandmother again. All’s well that ends well, for Coral Sands brought years of joy to Grannie, so much so that she planned a few Carson Family Reunions there. It will forever be a place that holds millions of memories for me, as well as many of us. I can see her floating in a gully in the ocean (she did actually fall asleep in the ocean once). I can picture her still in the gazebo, staring out into the sea, soaking in the peace that seemed to keep her going, no matter what trials may lay ahead. The last thing I found, tucked in a drawer, was a list of phone numbers for all the major news networks. We are talking about FOX news, CNN, the whole nine yards. If this doesn’t say “feisty” I’m really not sure what does. I think she had a pioneer woman spirit that she got from my Grannie Miner. She didn’t hesitate to share her opinion, which mostly started with the words, “I just don’t understand why…” Unfortunately, I, too, inherited the stubborn, opinionated gene. Therefore there were several subjects that we mutually agreed to disagree on and were not broached…most of the time. However, even after those conversations that became a bit more heated than anticipated, love won. And this, I think, fully encapsulates what Grannie was all about. Love. For everyone. In whatever way possible, Grannie loved the people around her in whatever way she could. She listened to the stories of those who bagged her groceries and of those who helped her choose dresses for her great-grandchildren. She wrote letters to supervisors praising employees that went out of their way to help her. She left bigger than expected tips for the housekeeping staff at Coral Sands, staff that I am sure every year fight over who gets to clean her room. She smiled at every baby and chatted with every child within a twenty-foot radius of her. And each one of them always smiled and talked back. None of them, nor their parents, ever shirked away simply because they saw the love emanating from her eyes. Oh to love as she has loved! I know that my mother was not perfect, as none of us can possibly be, but I think God must have thought she was pretty darn close since He shared His big day with her. Just as Jesus has come back to us, risen from the dead, so will Grannie be alive in our hearts and in our actions as we seek to love as she did. It is our job to carry on her legacy of caring about everyone, to rise to the tasks set before us, be they great or small. To carry out this mission is to honor her every day for the rest of our lives. 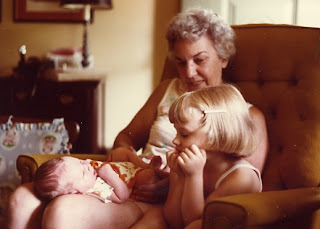 Just so you know, Grannie knew you loved you fiercely and deeply. Over an over, as she lay in the hospital bed, she reiterated how blessed she felt, as her room and her house were never without company. The boxes of cards and letters she saved over the years testify to the richness and fullness of her life on earth. Now has come the time for us to release her fully into our Father’s faithful hands and to those who have gone before her. Oh to hear the sound of her welcoming. Perhaps what gives me the greatest joy is knowing that after 52 years, she and Howard are back together again. A line from her favorite hymn, Amazing Grace, is the most fitting conclusion I can bring. On Easter Day, my grandmother rose to Heaven on the same day as her Lord and Savior. I always knew she was as perfect as a human could be and apparently God agreed. He shared the anniversary of His resurrection with her. Really, what more could one ask for? There is so much to comfort me -- she died in her own home, she is free of pain, she was surrounded by her dearly loved, she went to Heaven with Jesus, she looked peaceful as she passed. But, oh the sorrow in my heart! There is so much to do to get ready for the funeral. Then there are the children. Grieving with children is so much different than grieving in an adult world. The kids know I am sad and in their own way, I know they are sad, too. They don't really understand. I don't have time to cry all day. Life somehow seems to go on. I still play Barbies and fix lunch and make sure they brush their teeth. But then, I'll be in the middle of doing something and all of the sudden this guttural sound threatens to escape my mouth, my heart falls, and all I want is to wail. She is not coming back. I cannot call her. I cannot hold her hand. I cannot hear her tell me she loves me. She will not call me to ask me what size the girls are wearing or to ask me what she should get at the grocery store before we arrive for our annual beach vacation. She cannot answer anymore questions about her childhood. Wait, what is her middle name? What if I forget everything she has told me? What if my kids forget her? I know that everyone has to die. I know she lived a full life. I know she loved me fiercely. I know that she knew I loved her and that I would have been by her side EVERY SINGLE DAY if I could have. I know eventually all of these things will easy my pain, but right now everything just hurts. I know I have much to be thankful for, but at times the loss is too overpowering to really feel thankful. But, I do thank you. Thank you for walking this journey with me. Thank you for reading my posts. Just knowing people are reading and listening means so much. My friends and family have been invaluable. I guess the pain isn't so overpowering that love can't get in. Maybe that was Grannie's secret to being almost perfect. She always let love in. I found out today that the priest from Grannie's church came and read the Last Rites. Last Rites. Last Rites. Last Rites. Last. Rites. I was taking a shower earlier and thought about how we'd drive up to her house when we arrived for the funeral. All I could envision was her running out the front door upon hearing our friendly honk, arms outstretched, waiting to envelope us in ever-sweet grandmotherly love. Sadly, she will never run again on this earth. Sadly, I will not feel her arms around me or see her embrace my children. Tonight, I was scanning in decades of pictures so we could make a slideshow for the reception at the funeral. I couldn't get over her smile in so many of the photographs. Just abundant joy. Pure, unadulterated joy. She didn't have an easy life. Her husband died unexpectedly after only nine years of marriage, leaving her with two little boys to raise on her own. She has taken care of so many of her family members - physically, emotionally, spiritually. She has had breast cancer, lung cancer, and now cancer throughout her body. It has not been a pain-free life by any stretch of imagination. Yet, she smiled, even laughed, bravely through it all. Pure joy. Right now, she is still alive, but the hospice nurse says that she would be surprised if she makes it though the weekend. As much as my heart is heavy (and this is a huge understatement), there is a just a touch of me that slightly smiles at the possibility of her dying on Easter Sunday. A day when death has been defied. A reminder that I will see her again -- pain-free, running to me with arms open-wide. Abundant joy. I pulled out my Book of Common Prayer (I am an Episcopalian) to read through the ministrations to the sick and at the time of death. I am not sure exactly which prayers the priest used today, but I am fairly certain A Prayer for a Person Near Death must have been said. Almighty God, look on this your servant, lying in great weakness, and comfort her with the promise of life everlasting, given in the resurrection of your Son Jesus Christ our Lord. Amen. Oh, her body is weak. And, oh, I know she is ready to go home. I think this is one of those situations in life where I know I am going to survive this, but I am just not sure how. I can see the tsunami heading straight towards me and all I can do is stare at it in fear. It is so big. It is so powerful. It blocks out the sun. On the other hand, I know my God calms the sea. I can feel Him tempering my grief -- it threatens to crush me, but He is my strength. The road ahead will be hard, steep, and long, but He is my rod and my staff. He will comfort me. 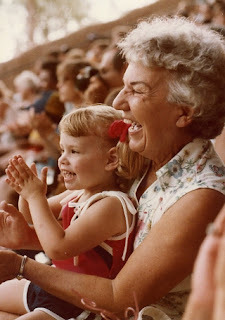 Grannie and me at Sea World (1981). 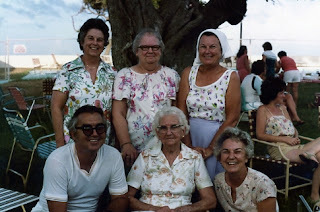 Grannie is on the bottom right in this picture (1980).